5.5” x 8.5” softback in very good condition. 144 pages. 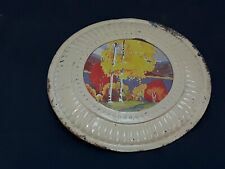 Vintage Antique TIN Chimney Stove Pipe FLUE Vent COVER Metal Plate Fall Colors. Condition is Used. MEASUREMENTS: 8.25" diameter. Has rust and chipped/scratched paint. Made of tin. Vintage Flue Cover Oval wth Pink Yellow Carnations Made in Germany 6 1/2" X 9"
Pink and yellow carnations. No issues. Circa 1920s. We do our very best, but we are not infallible. There are occasions when we miss a tiny hole or a little stain spot etc. RECTANGULAR ADVERTISING FLUE COVER: BEAUTIFUL YOUNG WOMAN. STRASBURGER'S. 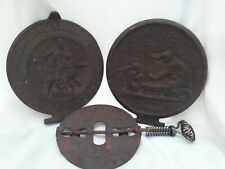 Lot Arcadia LHIVER Griswold Stove Covers Flue Vintage. Condition is Used. Shipped with USPS Priority Mail. Victorian Woman Flue Cover Stove Pipe Cover, lovely piece - it is great shape, measures 9 1/2” across - PLEASE ZOOM IN AND EXAMINE ALL PHOTOS FOR CONDITION! Any questions just ask! One is of a romantic couple in a canoe, surrounded by water lilies and with a sailboat in the background. The other is of a sweet young girl with a huge lacy collar and a big blue bow in her hair. Both flue covers show edge wear and the one with the couple has a little gap at the top. Collectable Adorable Artwork features 3 playful kittens one trying to catch a fly on the wall. Chain is in great condition! It's in nice condition and has a great look. This is a very nice antique flue cover depicting a mother with her daughter going to feed their chickens. The flue cover is not marked, but most of these were made in Germany or France. Griswold American 5 Inch Steel Spindle Reversible Stove Damper 525. Condition is Used. Shipped with USPS Priority Mail. "To My Sweetheart" is a beautiful wall hanging! Size is just over 11" high by 8" wide, acrylic covered and framed with linking chain by Gallery Graphics. Pre-owned item in terrific condition, looks great! Two different ones. one Erie PA.
Has a rope style detail on the edge. Vintage Chimney Flue Cover Brass Ye Olde Tavern Wall Hanging Plaque Flu 12"
Antique Chimney Flue Cover-WINTER SCENE. Condition is Used. This flue cover came from my great-grandparents farm house, and photos show it there before 1930's. I've not done any cleaning to it, theres light surface rust on the shell..but the winter picture scene is clean and in very nice condition. The complete cover measures 8" in diameter, the picture scene measures 4-1/4" in diameter. The two wire clip holders are original with the cover. Thank you..Bruce. Shipped with USPS Priority Mail. My knowledge on this is very limited. I believe this to be in very good condition for age. This is beautiful piece to add to any collection. What you see is what you will receive. Angelic girl makes a beautiful wall hanging. Size is just over 11" high by 8" wide. Pre-owned in very good condition, looks great. The back painted glass and print are in very good condition and the original chain is present. We attempt to describe in detail and photograph even the most minor bump or scrape. Marble has two Marks - Yes it polishes great /. Top of Piano opens. Removable Label on bottom says Italy. Leaning through a window, flirting with a woman. Antique Victorian Flue Cover. Picturing what appears to be a WW1 soldier. Check out the photos. This is the actual cover you will receive. Beautiful colors and unique. Back of flue cover is stamped, “made in Belgium”. Very NICE stove pipe ring "FANCY" by the Adam's Co., Dubuque, Iowa. See pictures. 7-3/4" antique vintage chimney flue of woman reading. Check out my other flue listings. ANTIQUE FLUE COVERS- "THE FLOWER GIRL" & "CURLEY TOP"
2- VICTORIAN FLUE COVER "THE FLOWER GIRL" & "CURLEY TOP". I'VE OWNED BOTH LOVELY EXAMPLES OF FLUE COVERS SINCE 1980. BOTH FLUE COVERS ARE ALL ORIGINAL AND IN EXCELLENT CONDITION. THE WAVY, BUBBLY GLASS IS EVEN ORIGINAL TO BOTH PIECES. This piece was made in Belgium. There is a tiny pit mark, which I have pictured, otherwise in VERY GOOD CONDITION! The gold trim has a couple light scuff marks but nothing that detracts from the display of this piece. Vintage Copper Roman Warrior Wall Plaque Hanging Chimney Flue Cover 10"
Flue Cover 7 1/2" Diameter, Lovely Young woman with Red Poppies in her Hair. Very Good Condition, Glass front. Metal beaded Frame and Original Chain all Intact. Made in Germany and marked on back. Very pretty. 1900-1950's Thank you for looking. SHIPPING WEIGHT 1lb (one pound) The photo has a hazy look, Not realistic, will put more photos on tomorrow which will reflect the true beauty of this flue cover. Antique Griswold 5 1/2" Damper Flue, Griswold Erie Pa, Patent Pending, Steel Spindle. If I make a mistake I am always willing to rectify it. One young woman plays a lute and the other an auto harp and tambourine. These date to the early 1900s approx. 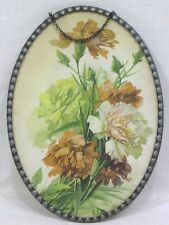 Nice collectible Antique Art Decor. Glass shows age. Scratches and paint loss to small areas of the circular gold painted "mat".